There are many critical tools that are needed for doctors, nurses and healthcare professionals in order to make proper diagnosis. Healthcare professionals are better prepared for medical emergencies when supported by medical devices that are functioning as they should be. From performing in the operating room to executing properly in the emergency room if medical devices fail patient lives are put at risk. If medical equipment fails to work correctly the patients quality of care decreases and it affects their safety. In order for medical equipment to continue to function properly it is crucial that it is accurately maintained. This is one reason that medical facilities are known to outsource preventative maintenance services for medical equipment. Below you will find concrete evidence on why regular maintenance and medical equipment repair are imperative to the health of your patients and medical practice. Truth be told medical equipment that is regularly maintained following manufacturer guidelines is safer and more reliable for patient care. Regular maintenance on medical equipment also helps to ensure machine operators are protected from machine failure. Potential issues can be acknowledged and resolved before causing malfunction to the equipment and personnel downtime. It is important to remember that depending on the size of your facility maintenance can be performed in house or out sourced. All businesses are looking to work more efficiently. Providing regularly scheduled routine maintenance on medical equipment helps to allow your medical facility, no matter how big or small, to run more effectively. Being proactive in equipment repair and maintenance allows facilities to plan accordingly for equipment to be down. Unexpected downtime leads to a decrease in patient care, an increase in scheduling in interruptions and loss of productivity. Scheduling time in advance allows patient care to go uninterrupted. Preventative maintenance saves facilities a lot of money. Routine maintenance on medical equipment is significantly less than regularly replacing expensive medical equipment and supplies or paying for emergency repair services. Instead your equipment is kept operating at the top of its game leading to increased longevity and a higher return on your investment. In the long run by performing regular preventative maintenance and repairs you are helping to decrease the operating costs associated with running your medical facility. In order to preserve the reliability of your medical equipment, work more efficiently and decrease equipment expenses it is important to perform regular maintenance. A schedule can be created online to better help your medical facility track, record and analyze data. This will help your facility increase the reliability of the medical equipment used within your facility. 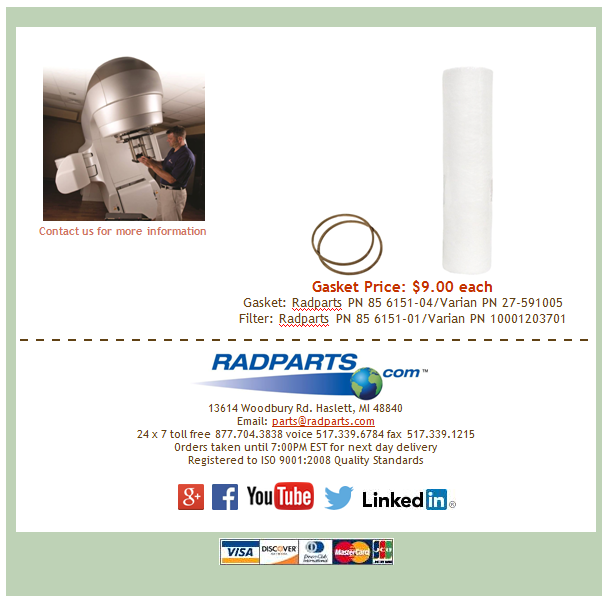 Radparts is the world’s largest independent distributor of OEM replacement parts for Linear Accelerators and Radiation Oncology equipment. 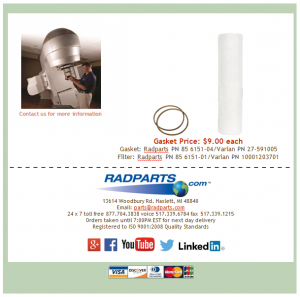 We provide high quality, user friendly, low cost parts support for linear accelerators and radiation equipment. 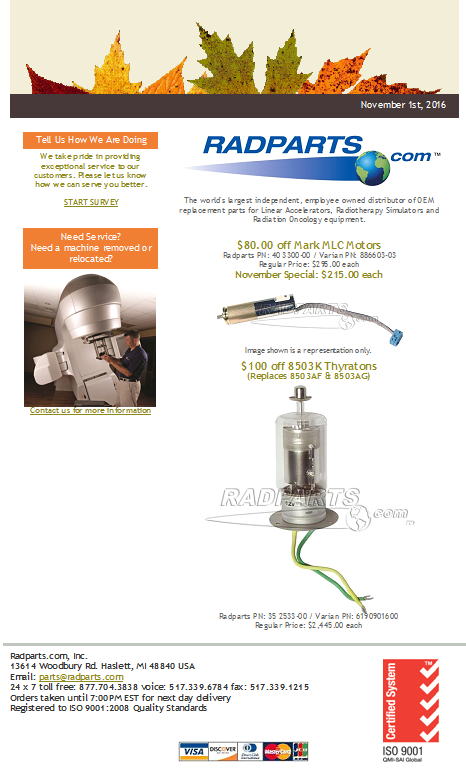 For more information on low cost parts for repairing Linac equipment find us at http://www.radparts.com. There will come a time and day when all medical equipment within your facility will need to be maintained or repaired. Do you know who you will call? There are a wide range of companies available to service medical equipment. 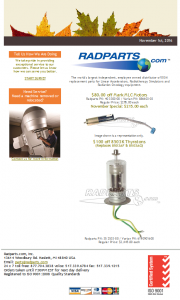 It is important to find a reputable company to work with that offers a wide range of service needs on medical equipment of all kinds including linear accelerators, ct scanners and other life saving pieces of equipment. Look for a company that doesn’t just repair equipment; look to work with a medical equipment repair company that offers a wide range of services. Look for a company that offers the following services: installation, set-up, repairs, preventative maintenance, testing, replacement parts and new & refurbished equipment sales. Below is a detailed description of what each services entails. If there is one thing that all medical facilities should do is set up regular maintenance to be performed on medical equipment. It is imperative that you follow the manufacturer’s requirements for maintaining your medical equipment to increase the longevity of each piece. It will also help save your facility money with less equipment downtime, downtime that is scheduled without interrupting scheduled patients and decreases liability issues. It is important to work with a company that also specializes in the set-up and installation of medical equipment. There is a specific way that medical equipment needs to be handled and set up in a medical setting that needs to be done by specialists trained in operating setup. The company that you choose to work with should provide both on site and off site repair and maintenance services. The company should be willing to travel to your medical facility to make assessments, test and repair both operating & surgical equipment and tools on demand. There should also be a facility in which complicated repairs can be sent that offers the same quality repairs with a quick turnaround response. Working with a company that maintains a large inventory of new and refurbished medical parts for replacement is the best option. You will want to make sure that they also have their own connections to receive parts and supplies that are not in stock on a moment’s notice to avoid downtime. A company that works to combine all of the functions one may need to retain their medical equipment is preferred over hiring several individual companies to complete the tasks separately. One company providing refurbished and new equipment, maintenance, installation, set-up, repair and parts is a solid choice as it allows them to also track, analyze and make recommendations. In this installment on maintenance and care of medical equipment we will consider aspects in medical equipment care and maintenance including: contracting medical technicians, in house maintenance and basic and extended warranties. It is crucial that facilities protect their investments especially when it comes to expensive medical equipment that is not easily replaced. Medical facilities rely on medical equipment to be reliable and in proper working order as needed. Each piece of medical equipment is responsible for accurate diagnosis. Each technician is accountable for keeping the equipment software up to date, the equipment running properly and keeping patient care at the highest level possible. In our last installment we discussed why both proper usage and following manufacturer’s use and maintenance guidelines were crucial in increasing the longevity of medical equipment. In this installment we will further discuss ways to properly maintain and care for costly new and refurbished medical equipment. It is crucial that the technicians operating medical equipment are not only trained in how to properly use the machine but also on how to perform regular, basic maintenance. There are certain maintenance tasks that will not be able to be performed by equipment operator however basic upkeep is possible. This will allow for immediate response if the medical equipment has a failure which reduces downtime and interruptions in patient care. It is important to be aware of the operator’s capabilities and to know when to bring in professional help. With proper care, maintenance and usage there equipment will be able to run properly for an extended period of time. Problems can still occur and when that happens it is important to have an understanding of the products warranty. Failure on the facilities part to follow the recommendations of the manufacturer could void the warranty. This is why it is so important to thoroughly read and review equipment procedures and keep software regularly updated. It is vital for the longevity of the equipment in your medical facility to be regularly services by professional technicians. As with any large piece of equipment be it in your home or business regular inspections, cleanings and maintenance are required yearly to keep functions running smoothly. Service is offered in several different manners. Your medical facility could have a scheduled contract with service specialists, hire third party of vendors on an as needed basis or rely on remote assistance. The most important element that should be taken from these installments is that with regular care and maintenance provided by in house trained equipment operators and hired professional’s the longevity of medical equipment will increase. Medical equipment is costly and often requires a great deal of budgeting to purchase. Even if the facility is able to find refurbished medical equipment it should be assumed that it will be rather pricey. Gently used medical equipment that has gone through stringent refurbishing is one way that facilities can help cut costs. It is important to remember that proper maintenance and regular care of refurbished medical equipment is as important if not more important than that of brand new equipment for medical use. Proper maintenance and care is crucial for equipment that is used in the treatment of patients. Daily use wears equipment down quickly. In order to achieve the best results for patient care equipment must be kept functioning properly. If equipment is not maintained facilities run the risk of constant malfunctions and breakdowns leading to a decrease in customer care which makes the practice seem unreliable. Here are some valuable maintenance and care tips to help get your facility on the right track. The way that facilities care and use medical equipment daily will predict how long the machine will last. Improper use of sensitive medical equipment on regular basis will set the machine up for malfunction and failure. Medical equipment should only be used as directed by the original manufacturer. When medical equipment is used in a way that is not recommended there is a greater risk of harm to the patient as well as to the equipment operator. When medical equipment is purchased, whether it is new or refurbished it is crucial that the manufacturer’s instructions on proper use and maintenance are included. The manual will show a plan for regular diagnostics, updates to software and will advise facilities on hiring professional technicians to inspect and care for the equipment. It is important that the manufacturer’s guideline is followed. This will ensure that machine failure and snafus are kept to a minimum. In the next installment on maintenance and care of medical equipment we will discuss contracting medical technicians, in house maintenance and warranties. It is important to protect your investment. Medical equipment is expensive and not easily replaced. With the main objective of medical facilities being reliable, affordable patient care it is crucial that each piece of medical equipment is kept up to date, running as expected, providing proper diagnostics and keeping patient care at the highest level possible. In the year 1956 the first medical linear accelerator was used in treatment for the first time in the Western Hemisphere. It was developed at Stanford. As technology continues to advance, LINAC equipment is keeping track as the most superior radiation therapy option that is obtainable today. Linear accelerators manufacture and distribute radiation with undeniable exactness that until 1956 was unavailable. Treatment using LINAC equipment is precise up to the millimeter. Linear accelerator, with its advanced technology is used in all the most advanced radiation treatments. Working in conjunction with computers LINAC equipment can create highly sophisticated, goal oriented radiation therapy treatments including intensity modulated radiation therapy (IMRT) and intra-operative radiation therapy (IORT). Revolutionary treatments are altering the ways in which cancer is being treated. Radiation therapy is now an option for numerous types of cancers. More cancer patients than ever before can take advantage of the radiation therapies available today. Exactly what is it about radiation therapy using linear accelerator technology that makes this possible? Radiation oncologist therapists take images using digitized technology, both two dimensional and three dimensional images, to layout where the cancerous tumors lay within the healthy surrounding tissues and organs. This allows for incredibly targeted radiation treatment for the cancerous tumor without affecting the healthy tissues and organs surrounding it. With the accuracy of linear accelerator equipment patients are only required to hold still for approximately ten minutes while they receive the targeted treatment. Interfacing with computers, LINAC equipment can create highly developed, objective radiation therapy treatments. The computer systems are advanced enough that the technology stores information about the patients and the treatment they are receiving to help oncologists and radiation therapists chart a detailed course of action to follow. The benefits of using linear accelerators in radiation treatment over other options are abundant. One of the most basic advantages is the benefit of comfort and personalization. To ensure that cancer patients receiving treatment are as comfortable as possible while receiving treatment they are given full sized molds that have been personalized to their exact specifications. This allows patients the ability to be stabilized during radiation therapy treatments. When treating cancers in the brain a full sized mask is fitted to the patients face to allow it to sit comfortably in the position that is the most optimal for treatment. Most facilities also allow radiation technologists sooth patients by playing music during treatment as well. 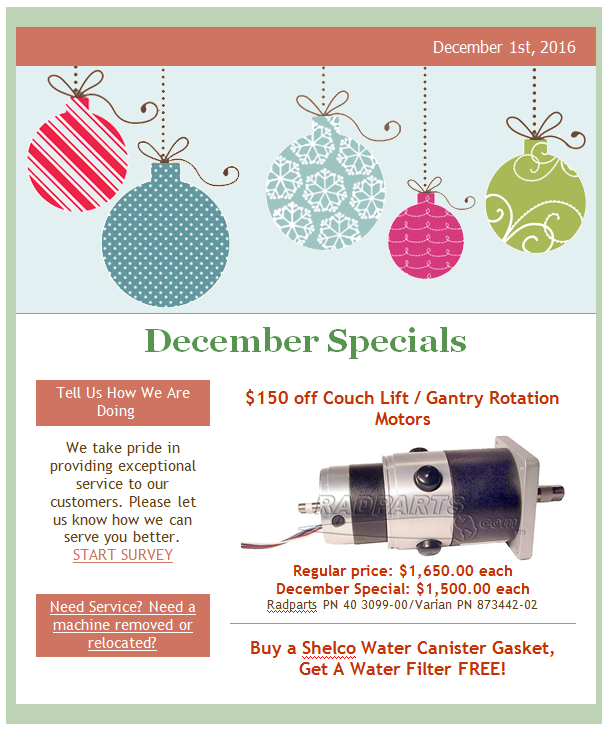 Need a machine removed or relocated? We take pride in providing exceptional service to our customers. Please let us know how we can serve you better. To order these parts or any parts from Radparts, contact us toll-free at 877-704-3838 or email us at parts@radparts.com. 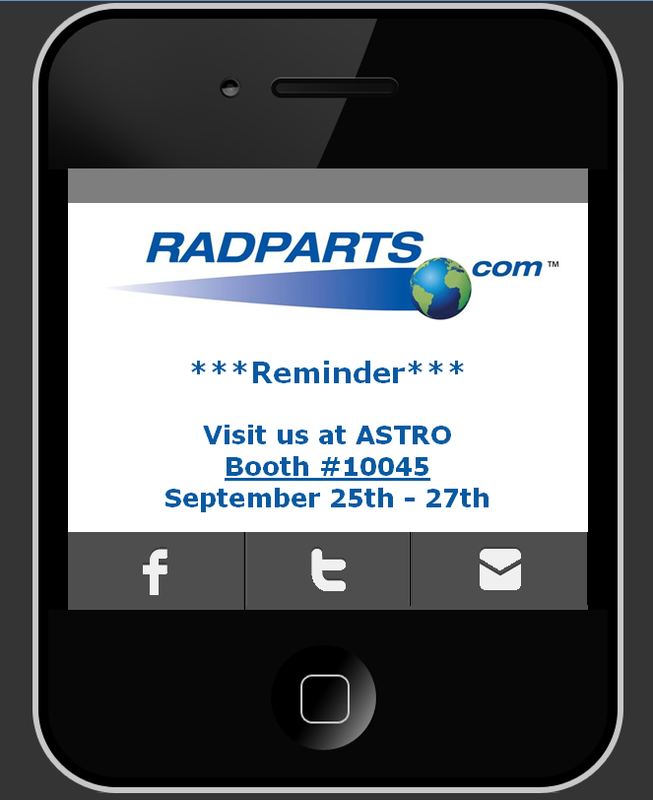 To stay up-to-date on the latest from RadParts, as well as its sister company, Acceletronics, subscribe to the Acceletronics blog today! Additionally, don’t forget to follow us on Facebook and Twitter. In the field of radiation oncology there is always a constant battle between bringing the best treatment options to patients while maintaining equilibrium to the budget. In this latest installment we will continue to look into strategies that can help medical facilities that are struggling to find ways to reduce oncology costs while working to maintain quality. In our last article we looked into purchasing refurbished linear accelerators and CT scanners to reduce the initial expense of large scaled medical equipment. Today we will look in to two different cost saving ideas: using existing equipment longer and contracting independent oncology equipment repair specialists to repair and maintain radiology equipment. When facilities hold off on large purchases, such as buying a linear accelerator, it allows them to allocate their budget into other areas such as patient care, facility upkeep and the medical team itself. The downside being that the latest technology available may not be in use. That issue can be addressed in numerous ways such as regularly updating equipment software and performing regular maintenance tasks. When performing these in conjunction with one another, facilities find that they can keep up with the upgrades found in newer equipment. It is imperative that all equipment within the facility meets all of the manufacturer requirements for maintenance. When maintenance is being performed on any large or small oncology equipment it is necessary that it is done by individuals who have been trained to service the model that is in use. This is an absolute necessity. Not all radiology equipment is created equally and therefore need to be serviced by professionals knowledgeable of your exact models service maintenance requirements. Another strategy that can be employed for reducing oncology costs is to hire an ISO to maintain and service equipment rather than locking into an unnecessary contract. An ISO can offer a substantial savings while ensuring service on demand at a lower cost. The upsides of hiring an ISO are plentiful. Not only can it save the facility money but time. Time is of the essence when maintenance or repairs are performed on large scaled medical equipment. When hiring an independent service organization take time to ask the following questions to make sure that the priorities of the ISO are similar to those of your medical organization. What is the estimated response time to respond to service needs? Can they provide references to match their response? Are there any guarantees on response time? Is support available 24/7 Are there extra charges for after hour support? What type of training is done to provide technicians with the latest skills necessary in maintenance and repair for newer technology? Can we choose between using new radiology parts or refurbished components when repairs and maintenance are being performed on our linear accelerators, CT scanners and other radiology equipment? Is testing and calibration done in accordance to OEM standards? Will service history be documented and kept on file to ensure compliance with the OEM standards? What are the hourly service charges? Does the facility pay for travel time? How long has the ISO been servicing oncology equipment? Are FDA and state vendor regulations met? It is important for hospitals, medical facilities and specialized radiation oncology treatment centers to look for ways to decrease expenditures without sacrificing patient care. Healthcare facilities must ensure that this is done in a manner that is compliant with industry standards while seeking to increase client satisfaction.